I want to close out my multi-week focus on the Gilded Age with a consideration of Edith Wharton’s novel The House of Mirth. Where Jacob Riis, Alfred Stieglitz, Stephen Crane, and Theodore Dreiser look at the grimier side of this famed period in New York City history, the underbelly that the working class and poor, the immigrants, and the homeless faced as they made their way through daily life, Edith Wharton focuses her attention on the world she knew best: that of the privileged, moneyed class. It seems odd in a way to say I “love” The House of Mirth. After all, the main character, Lily Bart, endures such a difficult downward spiral amid the harsh, judgmental upper-class echelons of New York City. The young, flirtatious, life-loving, aptly named Lily doesn’t stand a chance against high Manhattan society, whether it is those with old money, such as her Aunt Peniston, or those with new money, such as the Trenors and Dorsets. Lily’s story – as hard as it is to witness – is told fully, drawn exquisitely against the backdrop of Fifth Avenue mansions. Written in 1905 – first as a serialized series in Scribner’s Magazine and then published as a book – The House of Mirth brings to life a New York that most of Wharton’s readers would not have had the privilege to know. But it is a world Edith Wharton knew intimately. Born Edith Newbold Jones, she came from the uber-rich family that gave rise to the saying “keeping up with the Joneses.” Wharton spent her whole life in that rarified, upper-crust elite. She knew firsthand its luxuries and privileges. She also saw the ways in which it was stultifying, demanding strict adherence to a rigid set of mores and ostracizing anyone who dared to go against those mores. Lily Bart is an interesting case in point. A poor relation, orphaned and without an income, Lily is forced to rely on her aunt, Mrs. Julia Peniston, one of the so-called Knickerbockers who hailed from old New York money. Thus, Lily is a kind of stepchild, a pampered beggar at the very altar of wealth. She has been raised in this world, but she doesn’t have a firm foothold in it, much less a steady stand in it. In her late twenties, the beautiful Lily is beginning to lose her bloom, and the pressure is on her to marry. But Lily can’t seem to make a match. She is still full of youth, life, energy – and she is also frivolous and flirtatious, too much for her own good according to the moneyed society in which she lives. Through a scandal involving money and sexual harassment, Lily falls precipitously from the tenuous grace she inhabits at the beginning of the novel. By novel’s end, she’s had a rough go indeed. Indeed, The House of Mirth virtually epitomizes The Gilded Age. At the novel’s opening, Lily Bart lives in that gilded world – a world dipped in a shining gilding of gold. The era gets its name from Mark Twain’s 1873 novel, The Gilded Age: A Tale of Today , in which the venerated social satirist makes clear that all that glitters is not gold. What appears to be gold – the lush luxuries of the moneyed class in Manhattan – is actually just thin gold gilding masking serious social problems. Scratch the gilding a bit, and you’ll see the rot, destruction, corruption, and despair underneath. So, too, with Lily and her downfall. Wharton scrapes the gilding off, shows the dirty reality of the world in which Lily lives. When I wrote House of Mirth I held, without knowing it, two trumps in my hand. One was the fact that New York society in the nineties was a field as yet unexploited by a novelist who had grown up in that little hot-house of tradition and conventions; and the other, that as yet these traditions and conventions were unassailed, and tacitly regarded as unassailable. To learn more about The House of Mirth, check out Daily Kos’s take on it as well as “The Portrait of Miss Bart” in the New York Review of Books. You can view the illustrations from the original 1905 edition at the Edith Wharton Society website. If you want to explore Wharton in depth, you’ll want to read Hermione Lee’s biography of her . The website for Wharton’s home, The Mount, includes a biography and a consideration of her legacy, which inspired Julian Fellowes, the creator of Downton Abbey. You can take a virtual tour of Wharton’s estate, the main house, the stable, and the gardens. C-SPAN’s two-and-a-half-hour special on Edith Wharton – broadcast from The Mount – is well worth viewing. You can read The House of Mirth for free online at Project Gutenberg – but if you’re like me, you’ll want to curl up in your favorite armchair with a hard copy of this delightfully long novel. Listen:Listen now as I read Chapter 1 of Edith Wharton’s 1905 novel, The House of Mirth. 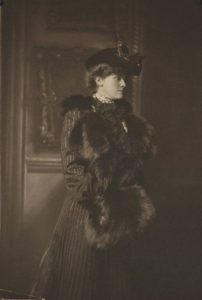 Image Credit: Edith Newbold Jones Wharton, 1907, public domain, https://commons.wikimedia.org/wiki/File:Edith_Newbold_Jones_Wharton_in_hat_with_fur_muff.jpg. Thanks for the StoryWeb on “House of Mirth” I enjoyed reading it several years ago as looked forward to a trip to New York. I love being transported to another world as I enjoy a good book.